Stigma fuels a culture of silence. When survivors of sexual violence are afraid to speak out in their communities and their pathways to justice cut off, impunity prevails. Because perpetrators know that they will not be held accountable for their terrible crimes, future violations are more likely. Such stigma and impunity pervade Uganda, where victims of wartime sexual violence who were kidnapped as children continue to face rejection and discrimination upon their return home. During his campaign against the Ugandan government, Joseph Kony’s Lord’s Resistance Army (LRA) captured thousands of girls, forcing them to be soldiers, wives, and mothers. 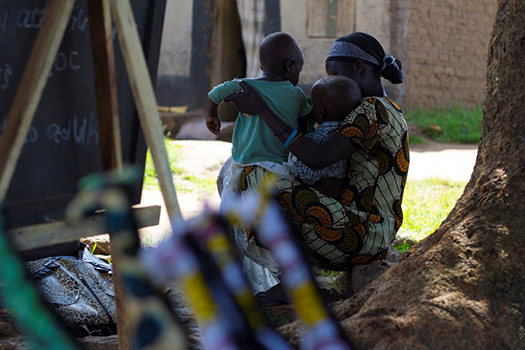 When these women escaped the LRA and returned to their communities, they and their children born in captivity were marginalized, cast aside because of their connection to the LRA. Due to the stigma that faces victims of sexual violence, particularly former LRA forced wives and their children, they had few paths to justice. Tomorrow, ICTJ together with World Vision and the British Foreign and Commonwealth Office will kick off a national dialogue in Kampala that aims to alter that dynamic, shifting the stigma associated with sexual violence from victim to perpetrator. We will gather different stakeholders including national and local government officials; community leaders; religious and cultural figures; and victims to discuss the ways in which stigma against survivors of sexual violence and children born of war is understood and manifests in communities across the country. How does it impact the recovery and reintegration of survivors of sexual violence? And how does it impact access to justice? And how can survivors overcome the obstacles they face? This conversation is critical not just to fulfill our obligations to victims, but to prevent future violations. If survivors are empowered to speak out and are provided pathways to justice, we can more effectively prevent sexual violence in conflict. Cultural leaders play a pivotal role in this dialogue. Stigma is a manifestation of deep problems in society: of discrimination, of power hierarchies, and of gender inequality. To unpack these issues and unravel the stigma facing victims, the leadership of cultural authorities in the affected communities is essential. In a country like Uganda that is particularly religious, that requires the intervention of faith-based leaders. I have worked closely with mothers and children born of war for years and witnessed the power of their stories. I also know how important the support of religious leaders can be in forging new spaces in communities. In November, I attended a screening of ICTJ’s I Am Not Who They Think I Am in Gulu, Uganda. The documentary explores the stigma facing children born in LRA captivity and their mothers, and the screening gathered many throughout the community: local government officials, community elders, religious leaders, and, most critically, victims and survivors themselves. Victims had spent years marginalized by their communities, but now they had the floor – their voices took center stage in the film and their remarks afterward forged a new space for dialogue in the community. Having them speak to these community leaders was critical: their remarks moved many in attendance, including the local bishop, to take action. Bishop Odama addressed the crowd, speaking passionately about the need to confront rejection of victims and to ensure that children born of war have adequate support. He himself pledged to sponsor the education of a child who was born in captivity. Odama’s words and actions were part of a shift in the perception of victims in their community. Not only did he push those in attendance to embrace the mothers and their children born of war, but in doing so he also provided a measure of public acknowledgement to survivors who are often overlooked. In short: by bringing the community together for a frank discussion of victims’ experiences and rights, the stigma began to move from survivors to perpetrators. Tomorrow’s conference, the first national conversation we have had in Uganda specifically about the stigma facing victims of sexual violence, aims to replicate that shift. By convening representatives from every level of society, we seek to facilitate a substantial conversation that will continue beyond the conference, developing the partnerships and strategies necessary to tackle the underlying cultural and community attitudes that fuel stigma. With the coordinated efforts of civil society, victims, government officials, and cultural leaders, we can work to end the culture of silence and break the cycle of impunity.